Let's get something straight, I never expected my experience in student halls to be filled with people who get quite as excited about certain types of cleaning products as me. However, I definitely didn't expect to have to endure some of the grim things that have happened this year either. There's always one who never cleans up after themselves, completely ignores any type of rules and just really doesn't have any consideration for anyone else - even when you tell them 5935845 times about your sensory issues and inability to cope with them spilling things and just not clearing it up. Again, don't get me wrong, I'm all for people enjoying themselves and whatever else that they want to do but when it's 2am and I have an exam the next day, I don't really expect someone to still be screaming at their video game. Just a little bit of respect, please. 3. The One That Is Always Drunk/"High"
I'm not going to judge people for their decisions, it just irritates me when that's the only topic of conversation. "Oh, I'm so high", "Yeah like I just smoked weed" etc etc etc, there's just no need for it. Do what you want but you don't need to tell me all about it. I mean, I can't talk, my culinary skills extend to spaghetti bolognese (which I now refuse to eat after my little food poisoning escapade) but there are some people who you can just tell have never turned the oven on in their lives. This one doesn't annoy me as much as the rest, it's quite comical really but I just don't understand how you can get to your late teenage years and not know how to cook pasta. 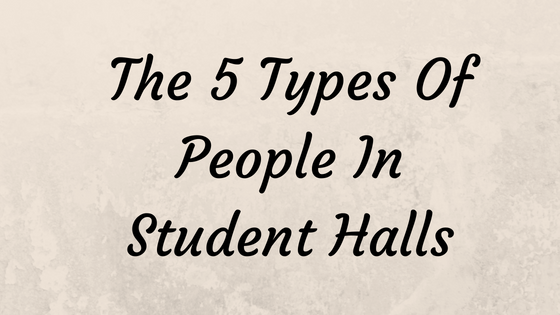 What types of people have you come across in student halls? Let me know! I work for a university in their student residences department, you would not believe the complaints we get! Actually, you prob will, This post is so spot on!